DAHLGREN, Va. –Dahlgren Heritage Museum hosts two special programs this week as part of a spring celebration of the museum’s expanded operating schedule. 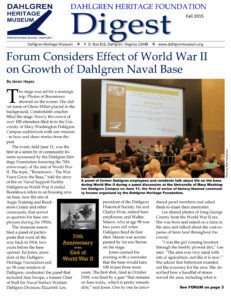 A guest panel themed “Life at Dahlgren in the 60s” is featured Thursday, April 28, at 4:30 p.m. Special guests include Chris Agnew and Elizabeth Lyddane, daughter of Dahlgren technical director Russell Lyddane. Elizabeth Lee, president of the King George Historical Society, will offer a presentation on “Dahlgren Before the Arrival of the Navy” on Saturday, April 30, at 10 a.m.
All special programs are hosted at the museum and are free and open to the public. Regular operating hours for the Dahlgren Heritage Museum are Wednesday through Sunday from 10 a.m. to 5 p.m. The museum is located in the former Virginia Gateway Tourism Center, 3540 James Madison Hwy., King George, Va. The museum’s exhibits and displays focus on the history of the Naval Support Facility Dahlgren, but also offer information on the rich history of Virginia’s Northern Neck peninsula of as well as statewide attractions.